As we continue to work on the Ultimate Engine Survivors Honor Roll, certain engines start to stand out for their incredibly long lifespans. Here's one that was built in some form from 1947 through at least 1997. The tale of Renault's Ventoux has the sort of plot twist we like to see with French automotive hardware, with a big comeback in South America after production ceased in its home country. 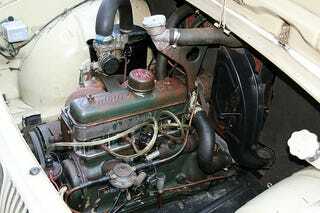 After being developed for the 4CV in 1947, the overhead-valve 603cc engine grew in displacement over the years as it was modified for use in such legendary Renaults as the Dauphine, Caravelle, 3, 4, 5, and 6. The Willys-Overland Interlagos, a Brazilian version of the Alpine A108, used the Ventoux… and what could possibly be cooler than a Brazilian Willys sports car? Eventually, Ford devoured Willys-Overland do Brasil and produced the biggest Ventoux of them all: a 1600cc engine known as the Ford CHT, which was produced until the late 1990s.